That is why equipment manufacturers provide a variety of industrial-grade components and peripherals to further enhance specific operations. Industries requiring specific operational functions can now take advantage of industrial computers. For example in the food processing industry, which requires components that are made with stainless steel construction. Its corrosion-resistant feature can improve the sanitation as this kind of material can also last in abrasive conditions and wash down areas. With these qualities, no wonder stainless steel has become a standard material for industrial applications. Now, to create a comprehensive computing solution, it is also essential to choose the right peripherals. 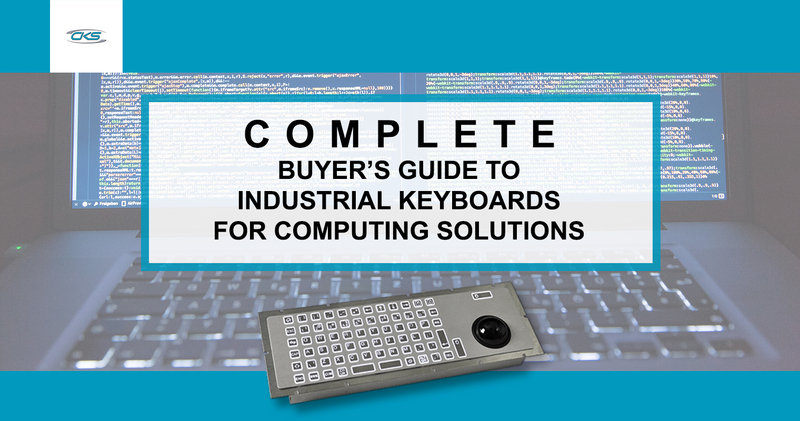 Devices like industrial keyboards are crucial for accurate data input and other industrial application needs. Basically, industrial keyboards are installed for industrial environments where extreme temperature, dirt, moisture, shock and vibration damages are rampant. Commercial-grade keyboards will not be able to last in these harsh working conditions. Unlike rugged keyboards, it has a specialised protection and construction. So, the inner electronic components are protected from these damaging conditions. Wear and Chemical Resistant Overlay. Having this type of overlay ensures that components are protected from chemicals and extensive use. IP65/NEMA4 Rating. This type of protection rating means that the component is protected from dust and liquid intrusion. Thus, the device is suitable for wash down areas. Integrated Pointing Device Options. These keyboards can be integrated with a trackerball or touchpad to maximise efficiency. Operators can easily navigate programs whilst having accurate data input. Industries that utilise panel PCs with ruggedised keyboards will definitely have more optimised operations due to the advantages it provides. Keep reading to see the specifications and applications of our industrial keyboards in different industries. Food processing has been a practice since the earliest days of human civilisation. Today, this method is done on an industrial scale. This is due to the increasing demand for maintaining a supply of nutritious food over long periods. The report shows that the UK food and drink manufacturing industry is set for a 3-4% growth in the short to medium term. By 2018 and 2019, the industry will reach a value of about £113.1B [Food Manufacture]. This only means that consumer spending on food and non-alcoholic beverages continue to increase, reaching £25.8B in the second quarter of 2017. This is also the main reason why food and beverage manufacturers utilise an automated system on panel PCs with ruggedised peripherals for an efficient monitoring and managing of operations. Note that the food processing industry always needs to be compliant with food safety standards. Due to stringent sanitation requirements, equipment must be able to withstand wash down areas. Several challenges in the food processing facilities include the presence of food by-products, extreme temperature, vibration and shock. What’s more, these facilities may also have a limited workspace for PCs to give way to bigger equipment. So, it is crucial to have peripherals that can provide an ergonomic solution whilst bearing a compact footprint. One of the most ideal solutions is to utilise a 96-Key industrial keyboard with touchpad. Even with its compact footprint size, it retains all the standard features of a 101/102 PC keyboard. At the same time, it has an integrated touchpad pointing device. Operators will have a more convenient time to navigate programs whilst having a more accurate data input. Given that the food processing industry needs to have strict compliance to food safety, it is essential to have accurate data input in PC systems. Good thing, the 96P rugged keyboard uses a mechanical switch technology. It provides great typing feedback whilst being able to last extreme usage. Thus, operators can precisely type in data which results in lesser miscalculations. Food processing plants are exposed to different liquids which can damage certain materials. But, the 96-key industrial keyboard with touchpad has a stainless steel (304) construction for an added resistance to corrosion. That way, it maintains a sanitary and hygienic work environment as per standard. In large-scale food processing, workspaces need to be carefully managed to ensure that all necessary equipment is installed. Our 96-key ruggedised keyboard with touchpad have cased, bezel, rear and flush mount options. It means that it can be set up in different work areas plus its compact footprint saves space for larger machinery. Distribution and logistics play an important role in ensuring that goods are delivered in a timely manner. It involves the efficient planning and moving of goods, so it is crucial that systems are streamlined. Throughout history, computers have made a significant impact in changing the distribution and logistics system. From a simple input/output of information, computers today are used for large-scale distribution and logistics software management. Many logistics companies now are upgrading their computing system to further improve the flow of operations. By setting up panel PCs with reliable peripherals, operators can efficiently navigate multi-faceted programs, send information over a secured network, and precisely input information. Distribution and logistics today have become more complex. As consumers and businesses’ expectations evolved, there is a constant demand for better and more efficient delivery method. Logistics companies would need to further streamline their overall operations to meet this demand and keep a competitive edge. Of course, due to large-scale distribution, it is definitely crucial to ensure that all information input in the system is accurate. Misinformation can result in costly errors and possibilities of backlogged operations. An excellent computing solution to address these challenges is to install a 96-key industrial keyboard to panel PCs. Its key features include multiple placement options, mechanical switch keys and IP67 protection rating. With these robust specifications, the peripheral can perform optimally even in the presence of extreme conditions. In distribution and logistics centre, there are only authorised personnel who are allowed to input and edit information. To prevent unnecessary changes, the 96-key ruggedised keyboard coding can be customised in accordance with specific functions. That way, only the authorised personnel can access these data and ensure overall information accuracy. Information accuracy is important in distribution and logistics. So, it is essential for operators to have a precise data input. Fortunately, our 96-key rugged keyboard has mechanical switch keys for better typing feedback. Users will have a more accurate and efficient data entry. Operations in distribution and logistics may have specific computing requirements. The PCs in certain operations may lack all the necessary peripherals due to compatibility issues. Out 96P industrial keyboard has different interface options so it can be easily connected to many PC enclosures. This ensures that panel computers at the fulfilment area can be set up with ruggedised keyboards for better data input. Military and aviation are constantly seeking ways to ensure that computing systems can be applied to many aspects of operations. And to do so, they are looking into rugged components to withstand the rigours of field use and other extreme environmental conditions. Data accuracy is crucial in the military and aviation industry. Military operatives are looking for ways to create a network-centric system where information can be efficiently and accurately delivered to authorised personnel. In aviation, accuracy in delivering data is essential for operatives. This information is documented in manuals, checklists, flight plans, etc. Inaccuracies in these data may cause costly errors and delayed flights. One of the key challenges in the military industry is choosing the right equipment for computing functions in several military applications. It must have the capability to withstand heavy usage, extreme temperature, dust, dirt, and shock and vibration damages. Moreover, data security is also a top priority. So, operatives must have a reliable computing solution that will allow them to maximise the security of information. This is also similar to the aviation industry. Its operation must also bear a computing equipment with suitable peripheral devices. This is to ensure that it can still provide functionality even in the constant presence of acoustic noise from engines. Plus, it should also have multiple placement options for seamless installation and operation. For a seamless and accurate data input, our 72-Key illuminated industrial keyboard with trackerball is a great option. Its LED lighting, integrated trackerball and IP65/NEMA4 rating features can make it suitable for military and aviation applications. Since information is a topmost priority for military and aviation personnel, it is essential to heighten the security protocol for handling data. Our 72-key ruggedised keyboard with trackerball key coding can be customised. This means that only authorised operatives can be given access to this information. So, it prevents any form of data leak or incorrect data sent over the military network. Due to the varying environments in the military, it is important that panel PCs and peripherals be viewable even under tough ambient situations. Our industrial 72-key keyboard utilises LED lighting. As it does not consume too much power, it is suitable for military use where energy resource can be scarce. This results in a highly precise data entry whilst performing over extended periods. In military and aviation, it is advantageous if the peripherals of panel PCs can be easily installed in different workspaces. This is because it can provide better computing functionalities in different aspects of operations. Good thing, our 72-key ruggedised keyboard has multiple placement options: cased, bezel, rear or flush mount. Therefore, operatives can take advantage of the precision, accuracy and seamless navigation of this keyboard in multiple work areas. Steel manufacturing has become one of the largest industries in the UK due to the reliance of several sectors to this material. Automobiles, infrastructure, medical equipment, and several day-to-day utilities are making use of such material. Thus, steel manufacturers must need to optimise their operations to keep up with the demand. Today, more and more types of steel are being produced to cater to the different demands and requirements per consumer. For example, the advent of Advanced High-Strength Steel (AHSS) for automotive applications reduces the weight of a vehicle whilst improving strength. But, this type of application requires advanced technology as well. Therefore, steel manufacturers must have a computing system that is compatible with modern industrial applications. One of the greatest challenges in steel production is its working environment. Commercial-grade computers and peripherals are not built to withstand harsh conditions. These components will easily break down in the middle of an operation. As a result, it creates bottlenecks which can reduce the production rate. Now, it should be noted that a steel-making process requires careful calculation and data input. For best compatibility, having robust computing devices is a must for steel producers. Industrial-grade panel PC and peripherals are excellent computing solutions for steel manufacturing operations. Its robust construction allows it to last under the constant presence of extreme heat, dust, dirt, moisture, and shock damages. Our 96-key rugged industrial keyboard with trackerball is also capable to provide a seamless computing operation to steel processes. And, with its integrated pointing device, steel operators can easily and precisely navigate through programs used in steel-making. So, what more has this device to offer? Here’s a quick rundown. Our 96-key rugged keyboard has an integrated trackerball. Operators can conveniently switch from data entry tasks to program navigation. So, it offers a dynamic and seamless operation in steelmaking processes. Managing workspace is also important in steel production due to the involvement of large machinery. That is why our industrial 96-key keyboard with trackball have different mounting options: cased, bezel, rear, and flush. Hence, it can be easily set up in varying work areas in steel factories. Steel production facilities have an extreme working temperature. But, our 96-key keyboard can perform optimally between -20°C to +60°C. So, rest assured that this device will continue to function amidst harsh environmental conditions. Industries like steel manufacturing, military, food processing and logistics bear an extreme working condition. This is also amongst the most challenging factors that can damage a computing system used for industrial applications. But, this can be prevented by using industrial-grade devices. Of course, this includes its internal components and peripherals such as keyboards for navigation. Contact (+44) 01438 747111 today and start integrating industrial keyboards to your industrial operations today.